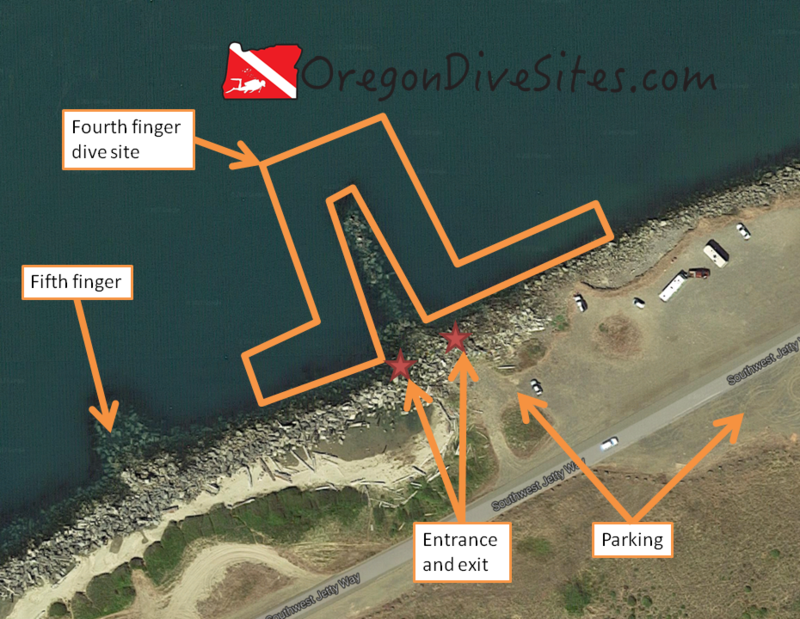 The fourth finger on the south jetty in Newport, Oregon is a great saltwater dive. 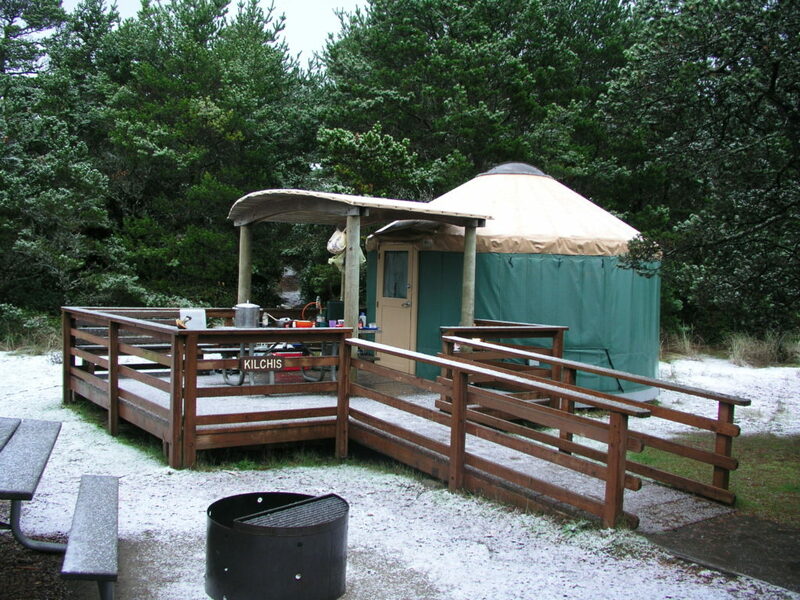 We have spent many great days diving on the Oregon coast at the fourth finger. For SCUBA divers who enjoy a bit of a challenging entry and sometimes difficult underwater conditions, this is a good place to check out. For divers who love searching for tiny life, you will be richly rewarded with many tiny nudibranchs, a bunch of different species of small crabs (and big ones, too! ), and many different fish species. Conditions can be rough at this dive site although conditions here are often better than at the fifth finger further down the jetty toward the ocean. Keep an eye on the weather and marine forecasts to make sure this site is where you want to dive when you visit Newport. In spite of some of the challenges of this site, we always love diving here and so will you! 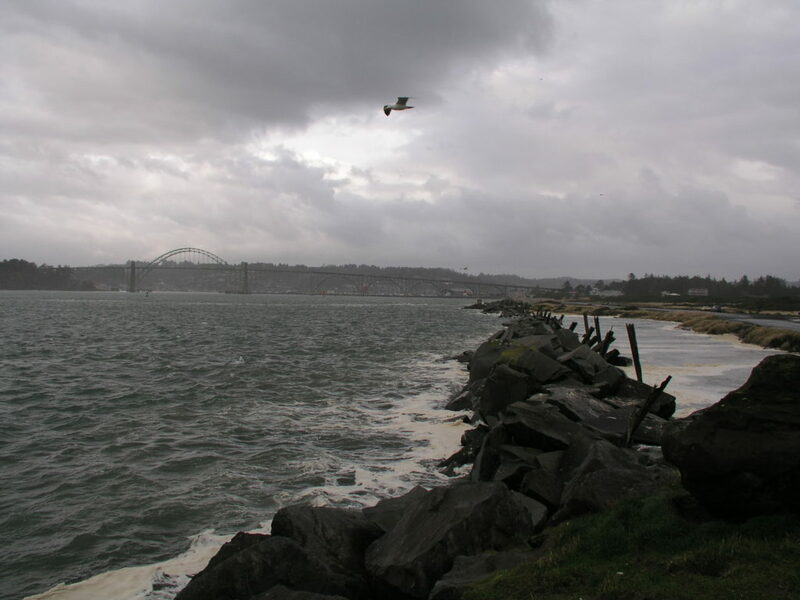 Looking toward the Yaquina Bay Bridge and the waterfront in Newport. The fourth finger dive site is in the middle of the picture. We love diving this site to look at all of the life that lives on the jetty rocks. If you are patient, have a good dive light (we have several that we recommend), and look closely, you will find whole worlds of tiny ocean life going about their lives between the rocks. Sea anemones grab microscopic fish and shrimp out of the water in front of your eyes. Little hermit crabs scurry around looking for food and new homes. Perch dart in and out of rocks, playing hide and seek with SCUBA divers. Dungeness and red rock crabs skitter across the bottom. This is an amazing site to dive if you’re willing to go slow and look around. For the spearfisher or the underwater crabber, this site offers lingcod, perch, rockfish, dungeness crab, and rock crab. We have gone spearfishing and crabbing here before with good success. Newport is just down the jetty from the fourth finger dive site. Follow signs to the aquarium and then head west toward the ocean along Southwest Jetty Way. There is plenty of parking at this dive site close to the entrance. We like parking right by the jetty but if parking is tight, the south side of the road has more parking. Imagery ©2017 Google, Map data ©2017. The fourth finger has ample parking. The entrance and exit are challenging but the life underwater is worth it. The jetty runs toward the west-southwest and the ocean. If you get separated from the jetty, head south and you’ll find it again. If you go north, you’ll end up in the shipping channel and you will not have a good day. The fourth finger runs roughly north-south. The fourth finger is about 150 feet long and can provide a whole dive of fun. At the northern tip of the fourth finger, you will most likely run into current either moving water out of the bay or water into the bay depending on which way the tide is swinging. On the east and west sides of the fourth finger along the jetty, the jetty rocks shelter yet more life to check out. While you can climb over the jetty rocks anywhere along this dive site, the easiest entrances and exits are right at the base of the fourth finger. Don’t get us wrong though. This is a challenging entrance and exit because of the huge jetty rocks, the surge (and sometimes the surf), and did we mention the big jetty rocks you need to climb over? You need to be fit, have good balance, and be nimble on your feet to do this entrance. We have seen a SCUBA diver fall on his face here trying to cross over the jetty rocks. Be careful, go slow, scout the entrance before you don your gear, and you should be okay. This is a saltwater dive. SCUBA divers can encounter a wide range of conditions here. We once saw the water glass-smooth and we have seen breakers crash over the north jetty and make it all the way to the south jetty. Usually divers will find some surf and surge at the entrance, and some current at the tip of the jetty. Pay attention to the marine forecast and the weather forecast. Only go diving here if you feel comfortable and the conditions are favorable. Fishermen and crabbers use the fourth finger. Be sure to watch for fishing line and crab pots. Occasionally we have seen fishermen casting their lines directly onto SCUBA diver bubbles. It’s a good idea to carry a good dive knife and some safety shears. Check out our Gear We Use page for the equipment we rely on every time we go diving. At high tide, we routinely see 15 feet of visibility at the fourth finger. At low tide, you will be lucky to get 5 feet of visibility. Big storms can reduce visibility. The bottom is sand and settles quickly if stirred up. The temperature in the winter at this dive site can get down to about 42F. In the summer, we have seen it up to about 50F although it varies based on ocean conditions and the tide. Any time of the year is good to dive here although storms in the winter reduce the number of days that you can dive the fourth finger. We have logged a maximum depth of 33 feet at this dive site at high tide. Changing bottom conditions can make this a deeper or more shallow dive but over the years, the depth has stayed fairly constant. We have seen just-certified open water SCUBA divers be successful at the fourth finger. However, the entrance and exit, the surge, and the current make this a challenging site regardless of your skill level. Be confident with your skills and be careful with your entrance and exit. The dive itself isn’t too difficult but the entrance and exit are physically strenuous. The current at the tip of the finger can be a challenge but if you dive at slack tide, this won’t be too much of a problem. Because of the entrance, we think this is an intermediate skill level dive. Depending on how close you can park, the walk will be 50 to 100 feet. Climbing over the jetty rocks is difficult when carrying all of your SCUBA gear. Go slow! There is no need for a surface swim here. Get in the water, descend, and away you go! We strongly recommend that you dive this site at or very close to high tide. At low tide, the visibility is not good. While the tide is moving, the current makes it very difficult to dive this site. In foul weather, this site can be unsafe to dive due to surf and surge. Watch the weather and marine forecasts and only dive if you are confident that it is safe to do so. We suggest taking a good dive knife and safety shears with you in case you get tangled in fishing line. On our Gear We Use page, we have several knives and a shears that we use and love. There is a dive shop in the South Beach part of Newport that can provide air fills and SCUBA gear. Newport has lots of restaurants. Tell us which ones are your favorites! South Beach State Park has good campgrounds. We haven’t tried any of the hotels in town yet but there are many.